THIS Inquirer’s six-week series Total Success — complemented by unique videos — is written and directed by Ruth Ostrow. Here executive Cheryl Bart talks about success and adventure. Total Success has showcased some of Australia’s most influential and charismatic business leaders talking about the often deeply personal subjects that have influenced their lives. Cheryl Bart is a lawyer and a director on the board of the ABC; a former chairwoman of the Adelaide Film Festival and the South Australian Film Corporation; chairwoman of ANZ Trustees; and a director of the org­anising committee of the 2015 Asian Cup. She is the mother of two children. And each of those steps took her literally to the top of the world. The summit of Everest. Bart was the first Australian ­female to achieve the Explorers Grand Slam, reaching the North Pole and South Pole and — ­accompanied by her then 23-year-old daughter Nikki — ­scaling the highest peaks of every continent in the world. The first mother-daughter team in the world to reach the peak of ­Everest, in 2008. 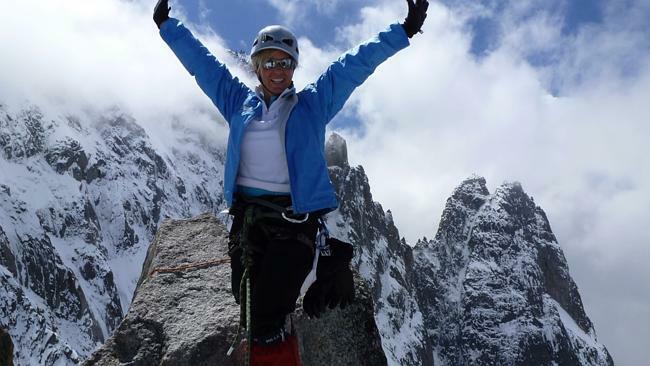 Like a growing number of professionals, executives and corporate leaders who are getting into the craze of adventure travel and sports, Bart recognises pushing herself physically and mentally, like when mountain climbing, ­enhances her approach to business. Much more than that, it’s a spiritual awakening and gives her a sense of meaning lacking in so many professional people’s lives. A woman who is classed as corporate royalty says climbing Everest was the closest thing to experiencing God. “I really felt that when we reached the top we were in a ­sacred space — in the Jewish ­religion, it’s the Holy of Holies — it felt like a place so ­sacred that we really weren’t meant to step there. “ And I did have a sense of awe and a sense of rapture standing there, in this extra­ordinary place. “So for me it is also the spiritual nature of the mountain.” In keeping with local tradition, she approached Everest with humility and reverence, and asked the mountain permission to climb. During an ABC board meeting, I filmed managing director Mark Scott trading stories with her about his latest adventure trip — walking the Kokoda Trail. But at a deeper level it also captures the quest for personal growth and care of the soul. New David Jones chairman Gordon Cairns, who I recently ­interviewed for this series, walked the testing Camino de Santiago spiritual route in northern Spain, staying in $5-a-night lodges. He told me it gave him a sense of the ­sacredness of nature. A corporate trainer friend has just taken a group of high-flyers across remote, rugged Mozambique and Swaziland to explore their “inner terrain”. Bart agrees adventure travel/sport is also about self growth: “It’s quite comfortable to be in your comfort zone in business, on the mountain, in relationships, but actually the magic happens when you put yourself out of that — when you try something dif­ferent. Often it is awful while you are doing it. She says there is financial gain: “Dealing with a goal, dealing with shifting circumstances, is what business is about. A business is like a shark. It can’t stand still or it actually withers away. “In order to thrive it has to go forward and in this day and age there are so many disruptive technologies every­thing is in a state of flux. Adventure also gives health advantages: At an international longevity conference I attended, consensus was that short bursts of stress, as opposed to debilitating chronic stress, were positive. High-intensity activity releases chemicals such as endorphins, and DMT, a chemical triggered during euphoria. Such chemicals in short bursts kickstart the immune system. But most of the professional people I’ve spoken to are not simply adrenaline junkies or into the status symbol of adventure — rather, they seek a deeper, richer experience of life. Christopher Dean, 62, the wellness mogul who built the Australian tea-tree industry and the Thursday Plantation brand, now chairman of global company Organic India, has developed a penchant for extreme skiing. “You go to the steepest cliffs in the deepest powder and you real­ise they no longer hold fear,” he told me. “It’s touching the Divine and facing death, and the triumph is ecstasy. You get a wonderful feeling of adrenalin, but it’s far more than a simple high. Her experiences have taught her to be happy in the moment, whether patting the dog or doing the dishes or riding sledge dogs through a snowstorm. The irony of wild adventures is that for busy professional people it seems to lead to a true sense of inner peace and quiet. “I’m often asked do I have a death wish, and I say, ‘You just don’t get it at all’. What I have is a life wish. I don’t want to die. I don’t want to be injured.